about the best construction engineers in the business! 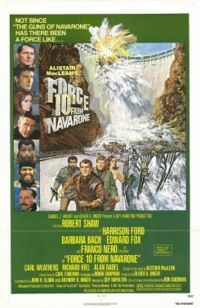 Some time after the successful Navarone mission, Mallory and Miller are summoned by Cmdr.Jensen and charged with identifying and killing a spy known as "Nicolai", who appeared briefly in the first film. "Nicolai" is now thought to be disguised among the Yugoslav partisans, under the guise of a Capt. Lescovar. To get to Yugoslavia the two men are paired up with "Force 10", a sabotage unit led by Lt. Colonel Barnsby, whose target is a key bridge in Bosnia. Barnsby considers having the two older men forced upon him as an unneccessary added risk to an already dangerous mission. In order to ensure absolute secrecy, they are ordered to steal an Allied plane from an airfield in Termoli so that no information about their flight to Yugoslavia can be leaked out. However, while breaching the perimeter fence they are discovered by US M.P. 's who are escorting Sgt. Weaver to captivity. A brawl ensues which ends with the M.P. 's overpowered and Weaver forcing his way onto the plane. After crossing the Yugoslavian coast, the plane is attacked by German night fighters, at which point several of Barnsby's team are killed, and the survivors have to bail out of the stricken aircraft. Once on the ground the remainder of the team attempts to link up with the the communist partisans (who were part of the Allied forces) and believe they have run across a group of such led by a Capt.Drazak. However, once at their camp they soon discover that these are not Partisans but a group of collaborationist Chetniks who are working for the German occupiers. Finding themselves in German hands, they attempt to convince the commander, Maj.Schroeder, that they are black marketeers who have escaped from Allied captivity with a valuable stash of a new wonder drug called penicillin, which Miller is carrying in his suitcase and refuses to open lest it become contaminated (the case actually contains all Miller's high explosive equipment). Schroeder does not initially believe them, but after receiving intelligence confirmation of the aircraft theft, he begins to wonder if there may be some truth in their story, seeing an opportunity to get rich by seizing the penicillin for himself. The following morning, after having opened the case himself only to find it contains nothing more than firewood, Schroeder quizzes Mallory and Barnsby, who claim that they buried the stash prior to being picked up by Drazak. While still sceptical of their story, Schroeder decides to send the pair to retrieve the Penicillin under the guard of his female Chetnik concubine Maritza, and two of his soldiers. Miller, Weaver and Reynolds meanwhile are left to languish in the cell block within the camp. Once they are some distance from the camp, Maritza shoots the Germans, revealing herself to be a Partisan spy and the person responsible for hiding the explosives in Miller's suitcase before Schroeder had a chance to open it. She gives them directions towards the Partisans under the command of Maj.Petrovich, getting the men to leave her bruised to enable her to return to Schroeder with a story of how they overpowered her and the guards. Mallory and Barnsby duly take off, ambushing and killing two of Drazak's heavily bandaged Chetniks who have been following them, eventually meeting up with a patrol of genuine partisans. Mallory immediately recognizes the leader of the group, Capt.Lescovar, as Nicolai, informing Barnsby for the first time of his and Miller's purpose for being sent with Force 10. While Mallory assumes that Lescovar has recognized him, they are nevertheless taken to Maj.Petrovich, who dismisses Mallory's story about Capt.Lescovar being the spy Nicolai as misinformation on London's behalf. Force 10's mission of destroying a nearby bridge that the Germans are preparing to cross with heavy armour seems impossible, in light of all the equipment being lost on the plane, until Mallory suggests they merely require Miller's presence, along with his case of explosives. Petrovich reluctantly agrees to let Mallory and Barnsby take two men, Capt.Lescovar and Marko disguised as the bandaged men (who it transpires were also Partisan spies), to try and spring Miller from the Chetnik camp. The four men manage to re-enter the camp at night, Mallory and Barnsby posing as the captives of the bandaged men. However, as the rescue is underway Drazak arrives with the bodies of the bandaged men, and attempts to beat the truth from Maritza until he's alerted to the four men's presence in the camp. A short gun battle breaks out in the cell block, killing Schroeder and Reynolds in the process, and in the ensuing confusion Mallory, Barnsby, Miller, Weaver, Lescovar, and Marko manage to escape in a truck, retrieving the explosives and rescuing the badly beaten Maritza on the way. Safely back at Petrovich's HQ, Miller is able to study the huge bridge which straddles the ravine and the river below. To Barnsby's dismay he declares that the bridge will be indestructable by explosives, but spirits are lifted when Mallory mentions a huge dam situated a couple of miles up river, which Miller is confident that, if breached, would destroy the bridge due the immense force of water impacting its foundations. A night time air drop is arranged to replace Force 10's lost supplies, which Lescovar sabotages by calling in German planes to bomb the illuminated landing zone, killing Maritza when she discovers him, her death explained as one of the many casualties of the bombing. This is the last straw for Petrovich (Maritza was his daughter), as he decides to send the men to Marshall Tito's headquarters where transport back to Italy can be arranged. However, the team decide with Lescovar's help to go instead to the German marshalling yards at Mostar, where they can obtain the supplies they require to breach the dam. After ambushing some Germans and taking their uniforms and a truck, they successfully get into the supply area under cover of darkness and obtain the requisite equipment. Lescovar once again betrays them, waiting until they are all inside a carriage on a freight train before telling a Sargeant to assemble a platoon to capture them. Marko, who is still outside, overhears the plan and raises the alarm by gunning down the platoon outside the train, at the cost of his own life. Lescovar desperately boards the departing train, claiming that Marko gave them away, but his luck has ran out. Mallory and Barnsby confront him in the carriage, and as he smirkingly admits his true identity Barnsby shoots him dead. The train is passing within a mile of the dam, so the team, now down to just Mallory, Miller, Barnsby and Weaver, jump off and head through the forest towards it. When they arrive it's lit up with large arclights, so Miller and Weaver set off some diversionary explosives to enable Mallory and Barnsby to sneak in (Weaver running into Drazak in the woods and killing him in a knife fight, getting a wounded shoulder in the process). Once inside the dam the two men head deep down into the tunnels which run through it. At the centre of one tunnel they set the charges, only to realise that they're out of time (the German armour is set to cross the bridge at dawn). Setting the charges on a short fuse, they walk away slowly, shaking hands and awaiting their end, only for the explosions to be small, covering them in dust. Thinking Miller has failed, they decide to get out of the dam, starting to run as cracks open up in the tunnels and water starts spilling in. The alarms start ringing on the dam, panic breaks out, and Miller and Weaver watch from the hillside as the dam wall starts to crack and collapse, millions of tons of water cascading from it. At the bridge, the Germans are starting to cross with their armour when the gigantic wall of water appears, thundering down the ravine. They abandon their vehicles as the water collides with the bridge, causing it to bend, sway, buckle then eventually collapse into the raging torrent. The Partisans watch all this in jubilation. As Mallory and Barnsby rejoin Miller and Weaver on the hillside, the team's own jubilation is short lived as Mallory reminds them that they're now on the wrong side of the river, unable to rejoin the Partisans, and that the area will soon be crawling with very bad tempered Germans. Added to all that, Miller hasn't so much as a box of matches left. As the credits start to roll the men wearily begin their very long walk home. Copyright(c) 2007 - 2020. All rights reserved.